The summer holidays were almost done. I had the whole garden, the fields, the lake and the sun all to myself! Until Grandad came home with that elephant. A young girl is happily enjoying her holidays with grandad but it is a short-lived feeling because grandad brings home an elephant and she is not pleased at all. At one point she very unkindly takes out her frustration on the elephant, even being mean to him. The illustrations are quite unique in this wordless book. They have a lovely vintage feel about them. I love the little illustrated vignettes in the corners of many pages where we see moments in time. There is no white space on the pages, every part is coloured and full to the brim with what is happening. The pages are thicker than most and have a linen type look and feel about them. A unique book indeed. The magic of wordless books is that readers can put themselves into the stories and interpret them anyway they want. The story then belongs to the readers. 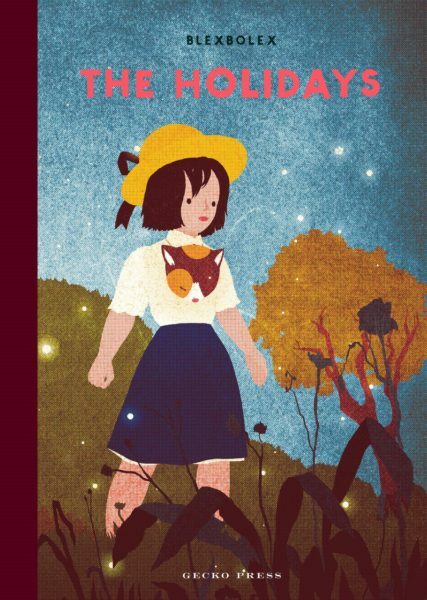 The sequence of events are well-played out and the wonderful illustrations take us on a journey with a young girl as she slowly learns some of the simple lessons in life. This is one of those books to read over and over and still see something different everytime. It is well worth checking out the question and answer interview with Blexbolex here. Not only will you find out more about the artist but you will see more images from the book which will show you just why this is so special. They say breakfast is the most important meal of the day and a good one will set you right for the whole day. So too, will quality time with family at the start of each day. The longest breakfast is the perfect example of the early morning chaos over finding the right breakfast. Poor Malcolm is bombarded with requests for all sorts of breakfast even someone wanting pudding. The baby toddles after Malcolm calling out toot, toot or bzzzzzzz but Malcolm is busy trying to sort out everyone else and we can see that the baby begins to feel ignored. I love how the illustrations of the baby start out small but as he gets more and more frustrated his illustrations become bigger until finally the baby has his own full page and is at last noticed by the rest of the family. Eventually everyone, including neighbours, come together for breakfast. A busy, warm, family-friendly picture book with bright colourful illustrations. Published October 2017 so not long to wait. What a delightfully funny board book of words. Simple but comical pictures of before and after events. Board books are mostly aimed at babies and toddlers but this is one that even adults will love. On the left hand side of each double page spread you have “my pictures” of an event where there are multiple little illustrations with a description underneath. On the right facing page you have pictures after the event with similar illustrations and descriptions. One example is “Before lunch” you have a loaf of bread and after you have a picture of crumbs. I particular love the page where the pictures of food are labelled such as “dobado” and “lebod” but “after a cold” they are of course tomato and lemon. And the page after corrections is also very funny. Such a simple idea, yet very creative and clever. Children will love making the connections and spying the changes. Lots to do, lots of surprises and lots of fun. I just love it and the kind of dry sense of humour which makes us laugh even louder. This is a perfect combination of story and facts. 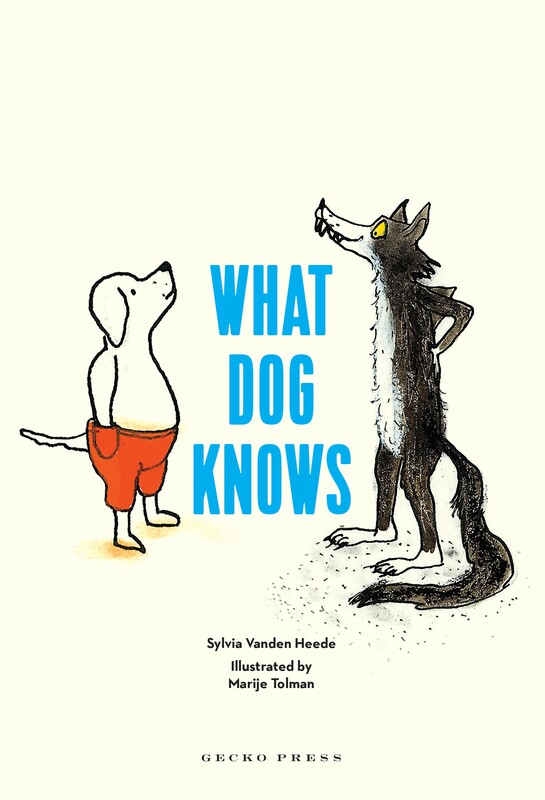 It is both a chapter book with a story of Wolf and his cousin Dog and their wonderfully quirky relationship but also a book filled with facts and quizzes and lots of humour. Wolf continually attempts to outwit his cousin but sometimes with only a little bit of information he gets confused and Dog has to fill him in with the real facts. The facts through out the book are bite-size and informative. I loved the chapter about mummies and the hilarious illustration of the recipe for a mummy (according to Wolf). While there are plenty of things in this book to try at home I wouldn’t suggest trying to mummify the cat but it is certainly a laugh-out-loud read. Wolf makes up little rhymes too which tend to annoy Dog but they do add to the story. There are stories and information about dragons, and dinosuars, pirates and robots but so much more. The end pages are gorgeous. Watch out for Wolf and his cheeky face under the flaps. It is an ideal book for readers who love facts, or animal stories, or humour. It really is a book with a little bit of everything. Aimed perhaps at the newly independent readers it still has something for any age whether parents, grandparents or teachers, this is a wonderful book perfectly accompanied by the funniest illustrations. 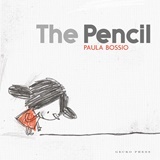 The pencil is a delightful wordless board book. A little girl finds a piece of string and lets her imagination soar as she follows it. I adore how she discovers, hoops, bubbles and even a monkey on her journey. However, like all good imaginations, hers also finds trouble. I love her smiles and sheer delight in the world she creates. This is a simple but gorgeous, funny and creative board book to be read over and over. However, don’t be fooled. The book does not end on the last page. Turn to the back cover and enjoy the real ending. Perfect choice for young ones. 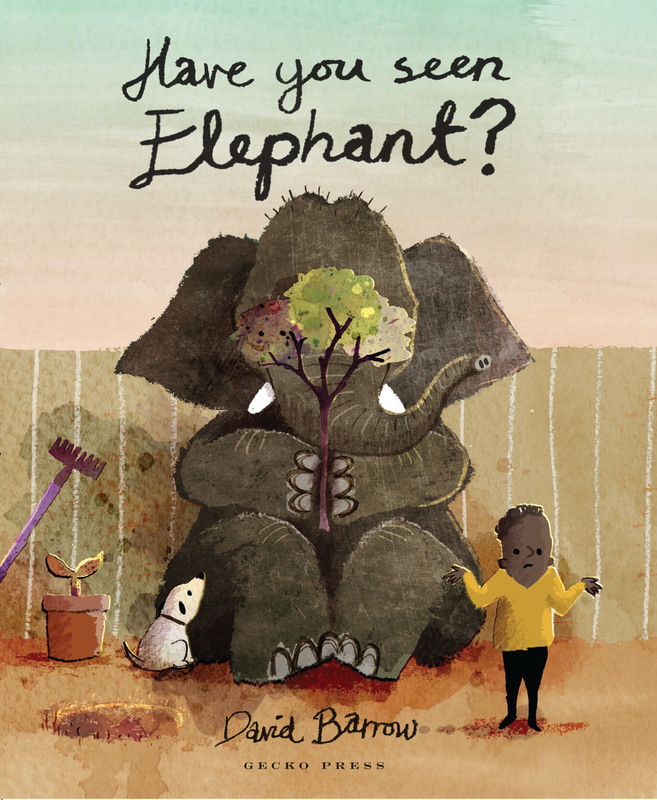 Tags: David Barrow, Gecko Press, Have you seen Elephant? I love this. Absolutely love the humour and the illustrations are just so delightful. Elephant is certainly very good at hiding. Hiding in plain sight that is, and he does it so innocently that it just makes you smile. I mean how can you resist this picture? Elephant is just gorgeous and they play so well together. I also love the tortoise, ironically named Zoom. Young children will get right in to this and laugh out loud when they find elephant in his hiding places. Simply delightful. I certainly hope there will be more from David Barrow. One of the things that make Gecko Press so special is providing teaching notes for many of their books which encourages a deeper look at the stories. The notes for Have you seen Elephant can be found here. 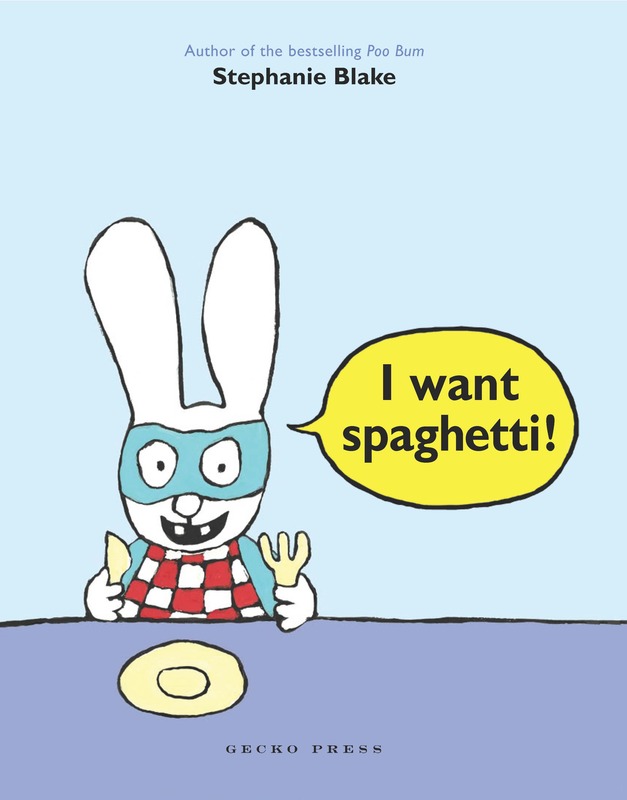 I want spaghetti by Stephanie Blake @geckopress : Simon the rabbit with attitude is back! Simon, the naughty little rabbit with attitude is back. No longer calling out “poo bum” or refusing to go to school, Simon is now a fussy eater. The only thing he will eat is spaghetti. He demands spaghetti for every meal and refuses to be persuaded to try anything else. His mother is well and truly over his picky eating. “That’s enough!” said his mother. And so begins his tantrum. This is ideal for young readers but even five and six-year-old children at school will love this and no doubt many of them will relate to Simon and his fussy eating. As with previous stories about Simon, the illustrations are simple yet bold and bright. They certainly have lots of appeal for young readers. And as with every good story, even though Simon is a bit of a rascal, readers can’t help but like him. Well worth adding to your collection of Simon books especially if you want to sit giggling with your child and enjoying the antics of a naughty little rabbit. If you want to delve deeper there are teaching notes here. This is not your average board book. For a start, it is a much larger format board book which makes it ideal for sharing with the whole family or a group of children. They will love pointing out all the different animals found within its pages. Crossing different landscapes we meet animals from the Arctic, to farms and cities and mountains, to Africa and China, and right across the globe. While on the surface it may appear to be a simple word book, it is much more than that. This book houses a collection so vast that children will find so much to talk about. It might be the different animals or it might the different habitats but whatever it is, this is wonderful opportunity to talk and discuss and that alone makes this a very worthy book to add to any collection. There is even a little family of mice who make their journey across the different continents and oceans. Well, at least I think they are mice. I might have to just keep reading the book again and again to be sure. I love the sloth! It is great to see that even our humble Kiwi has been included. For those that want to explore this book even more, especially in a classroom setting, do check out the teacher notes here. Pictures courtesy of Gecko Press. 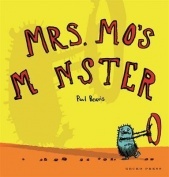 Mr. and Mrs. Mo are so busy that they have no time to play with Monster. So the little, and rather impatient Monster decides to go off in search of his own adventure, anyway. And what an adventure he has. That is until loneliness and hunger take over. Little monster soon realizes that those who love him are always near, always ready to protect him and keep him safe. Younger readers will love looking for Mrs Mo hiding just out of reach, as little monster takes on his first journey towards independence. This is beautifully illustrated in the most wonderful colours. Bright oranges, yellows and reds all bursting with sunshine and shadows. Monster has the cutest, quirky facial expressions which kind of pull at the heart strings especially when he is feeling a little weary. It is one of those stories to cherish and read again and again. A very reassuring tale of love and support. 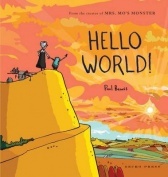 Do enjoy the trailer to the first book as borrowed from the author and illustrator Paul Beavis’ own website. Do check out his site especially the fun stuff you can do. Bert is in his 80’s when the novel opens and he is confronted by his great grandson Erueti; a boy who wants to know all about his ancestors. So Bert begins his story and it isn’t very long before we are drawn into the past. The year is 1943 and New Zealand is caught up with the second world war. Bert is 11 and eager to grow up quickly so he can go and fight in the war. He wants the adventure, the action and to defend his country. We begin to get to know Bert and his two sisters, Meg and Betty and the struggles of day to day to life. The Bakehouse is a book of mystery – just who is stealing clothes from the clothes lines in the middle of the night. It is also a book of danger and secrets and the secrets have the most power to destroy. In fact it is the consequences of secrets which Bert still struggles with some 70 years later. This is a moving, timely tale which is not only a great read but a solid account of the times. Without television the news came via radio and everyone would stop and listen. I loved the language, perfectly fitting for the era. I couldn’t help smiling at the terminology as it brought back my own memories. It also shows how language is always growing and adapting. A delight to read. Great for 9 – 13 year old readers and for many adults it is also great for a nostalgic look at the past set during times of war. And as for the ending – powerful – but you will just have to read it yourself. It is easy to see why Joy Cowley continues to win awards. Her writing is always top-notch and this is no exception. What an utterly charming book! Detective Gordon is a rather over weight toad who loves nothing better than eating cakes, drinking tea and stamping important papers. However, he is suddenly faced with a mystery when squirrel comes rushing in to declare that someone has stolen his stash of nuts. He soon thinks he has the culprit but instead it turns out he has caught a rather lonely, hungry and nameless mouse whom he takes under his wing, makes her his assistant and bestows upon her a name. Together they stand in the freezing cold, watching and waiting for clues which could lead them to the real thieves. I love how Detective Gordon and his new assistant become friends, their relationship taking on as much importance as the theft of the nuts. I can see why Ulf Nilsson is an award winning writer. His words flow naturally. The illustrations are also gorgeous. Just look at the cover and the expressions on the faces of the two main characters. 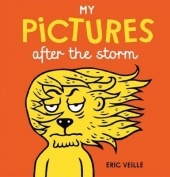 This is a great chapter book for newly independent readers aged 7 – 9. I think it would be equally as wonderful as a read-aloud by parents or teachers. I certainly hope that there are more books about Detective Gordon and Buffy his new side-kick. I would love to see what other mysteries they can solve. Once again Gecko Press have produced a quality book. “Stop! Fetch! Heel!” he bellowed. Then he ran off after the dog. This fable like story is both funny and wise and I can’t help but grin as I read it over again. I also love The King and the Rain. This quirky little book is beautifully illustrated by Wolf Erlbruch who also illustrated Duck, Death and the Tulip which sits on my bookshelf among my favourite picture books. The King is illustrated in collage format and he stands out amidst the white spaces on the pages. This allows us to really see him and begin to understand him more by focusing on his expressions and body language. This is great for families to read together but I also think this would be a wonderful resource to share in a classroom and open up discussion on values and what is important in life. In fact for those teachers who want to make the most of this thoughtful book, check out the teacher notes here. Gecko Press continually produce beautiful books and this is no exception. Dad takes his son out one evening to show him the universe. It is of course huge, and very special. They gather their coats, and one or two important provisions and set off on their journey. As with the best journeys, getting there is often just as special as the destination. They observe the little things along the way, things that build up a bigger picture of the universe and just how special life really is. This is a beautifully illustrated book just perfect for dad’s and sons to share together. Ulf Stark has the ability to connect readers emotionally with the characters in his books. Eva Eiksson’s illustrations brings those characters to life in a lovely visual way in gorgeous colours. And of course such a journey together also includes a bit of humour. Great combination and a book which I think, is just superb. 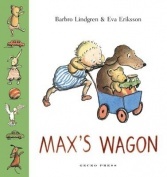 Delightful board books by Barbro Lindgren @geckopress Max’s wagon, Max’s bath, & Max’s bear. Perfect for toddlers. Max is a delightful toddler learning to negotiate the world around him. He loves his dog, his bath and his wagon. In fact his dog’s antics and facial expressions are just adorable and a little mischievous. 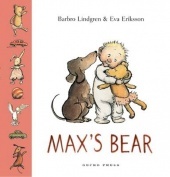 Max and his dog have little adventures; the kind every young child can relate to. There’s Max’s soft toy bear who falls in to trouble. There is a wagon full of toys and a lost cookie. Then of course, there is the fun of playing in the bath. These board books are gorgeously illustrated by Eva Eriksson. Text on one page allows the focus of the illustrations on the opposite page to grab our full attention. 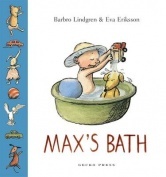 I love that there are no adults in the illustrations allowing Max his own little independence. These gentle and sweet stories will delight very young readers who will beg for them to be read over and over again. This a collection of twelve short and funny tales about grumpy animals living in the forest. 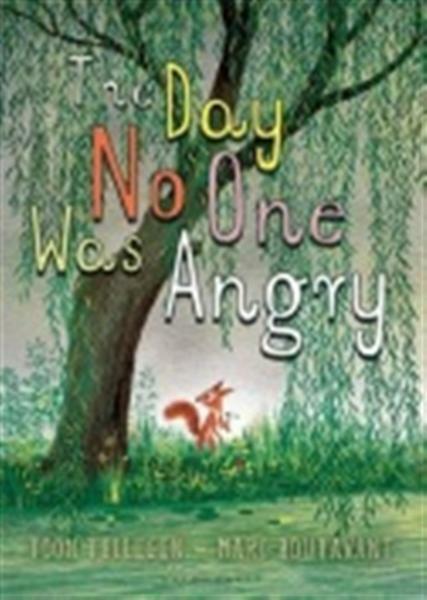 They have a fable-like philosophical approach in their telling and readers can’t help but laugh along at the antics of the grumpy creatures. It’s immediate appeal is its outstanding cover which just cries out to be picked up. Follow the story of aardvark who just happens to always be standing on his head and squirrel who questions the sense in aardvark’s choice. Or there is beetle and earthworm who try to out do each other by being the angriest. Or beetle giving instructions to cricket on how to look fierce. This is a delightful look at human nature through the eyes of some wonderful animal characters. Great stories which will be wonderful to be read aloud to young children. Older children will love reading the stories for themselves. The illustrations have a wonderful vintage look and feel which takes me back to my own childhood. Mindful of illustrators such as Virginia Lee Burton, Bill Peet and even Richard Scarry in his Little Golden Book days, the illustrator here is in very good company and the beauty of this is that the book will appeal to many parents and grandparents as much as children of today. And just in time for Christmas this will be great in Christmas stockings.